It was a big day for Gracie. 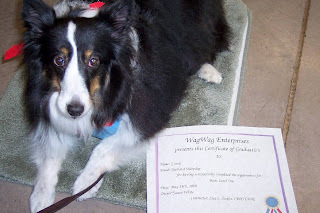 She went to the groomer and then graduation from her basic obedience class. I am so proud of her! She was very brave at the groomers. 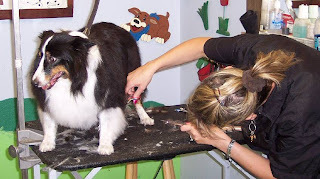 The ladies at "It's A Dog's Life" took the time to learn about her and make, what I assume is her first professional groomer experience, a comfortable one for her. She got her nails trimmed, a bath, and a nice brushing and cut all without complaint. She is beautiful, if I do say so myself. She was a little cranky with a couple of the pups at dog class that wanted to romp – maybe she thought they'd mess up her new doo. Her trainer Lisa explained that she gave an appropriate response to move the pups out of her space. I think we both felt a little embarrassed by her crankiness – but she calmed down and even tried to catch a nap. 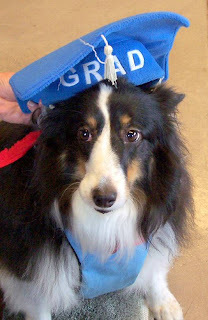 At the end of class, the dogs got their photos taken with their graduating caps. Too cute. 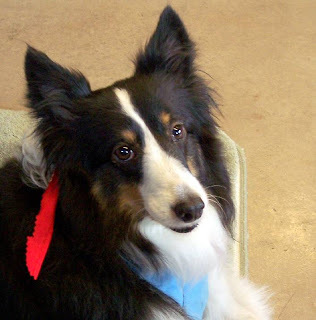 The positive reinforcement and good manners she learned from Lisa (WagWag) got her off to a good start in her new home. She did very well – even if her favorite command seemed to be "settle" – for which she got to lay down and get the occasional treat for just laying there. She is a very smart dog indeed.